The sequestered cluster of atmospheric restaurants in Baldwin Street Village might offer a plethora of cuisines but one glaring omission is French. A short walk off of this charming street towards McCaul will remedy this with the Midi Bistro. The casual and jovial setting of a bistro is more ideal to me for catching up with a friend instead of romantic excursions, and so I meet up with a pal at the quiet restaurant for an early dinner. We get our choice of seats in the nearly empty space and take a glance at the menus classic offerings. Not being overly hungry, only my friend chooses the prix fixe while I make a la carte selections. Trying not to impede the bubbling conversation, the waiter is quick and full of smiles as he brings us some passable bread and our glasses of wine. 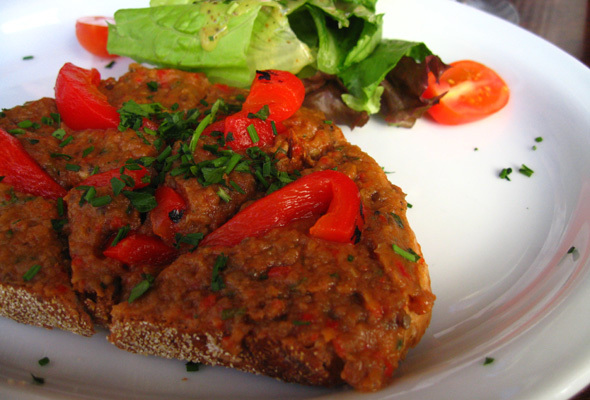 Starting with the pate and an eggplant and red pepper crostini, neither are particularly memorable. The pate is more like a terrine and it's chilled chunky consistency makes it difficult to spread over bread. While it's appreciated that such a thick layer of topping sits on top of my crostini, it makes it much more messy to eat. At least the flavours are bright in the spread and unexpectedly light. The accompanying salad is the highlight with its fresh greens, sweet tomatoes, and mildly vinegary shallot dressing. 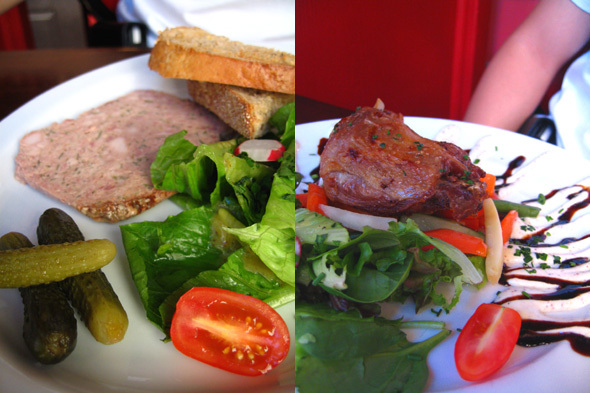 Duck confit is a must at a bistro, often posing as the dish to measure up by, and my friend gladly gives it a go. The skin is crisp, meat nicely moist and flavour is riddled with a gamey saltiness. It's a fair attempt but the shriveled portion size convinces us we'll have space for dessert. Tempted by the bouillabaisse filled with a vast array of seafood, it fails miserably compared to the confit. Overcooked and dried out pieces of whitefish bob around the old tasting mollusks in a basic but tasty fish stock. Dried out frozen fries arrive with both dishes to round out our entrees. Desserts for the prix fixe are the same as for the regular menu and are written up on a chalkboard above the bar. 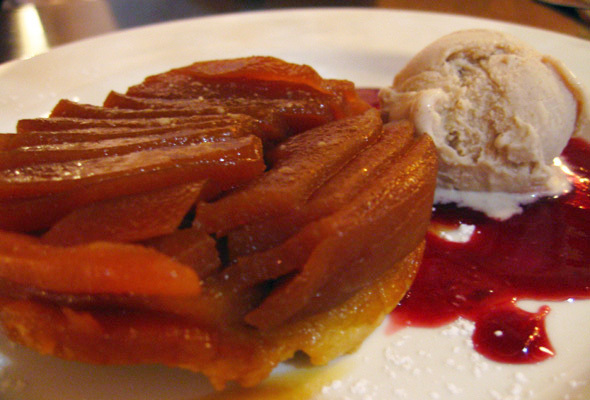 Creme brulee doesn't strike my fancy and so I nudge my friend towards the tart tatin with a scoop of cinnamon ice cream. The pastry is nice and flakey with a beautiful topping of meltingly tender and buttery apples. Ice cream scooped with it gives a nice contrast to the warm dish and spices up a rich dessert. Atmosphere seems to be what Midi Bistro has got going for it the most. There aren't quite enough moments of greatness in the selection of passable bistro fare, but what can you expect from a restaurant that doesn't even bother to make their own frites. 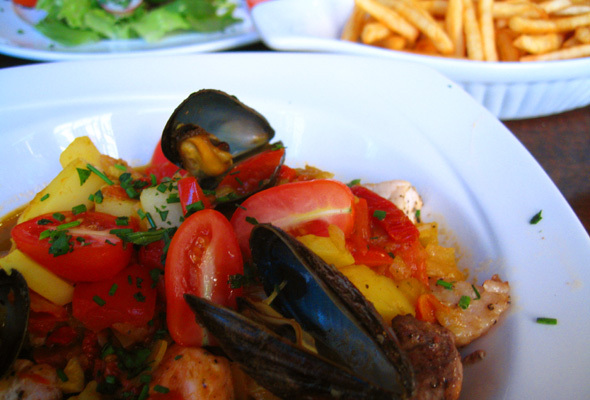 Dinner for two with a glass of wine each at the friendly Midi Bistro is approximately $85.